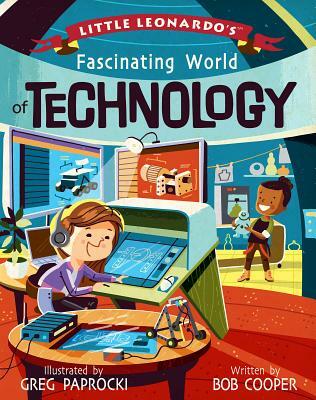 An introductory primer for kids focusing on the "T" portion of "STEAM" the ever-changing area of Technology. With original Renaissance man Leonardo da Vinci as inspiration, this fascinating new volume in the Little Leonardo series introduces kids to the wonders of technology and the people who create it. Learn how nine fields of technology are present in nearly every aspect of our lives. From the invention of the wheel several thousand years ago to the increasing miniaturization of our computers, smartphones, and other electronic devices, we've always been looking for new ways technology can make our lives easier. Part of the Little Leonardo's Fascinating World Series. Greg Paprocki works full-time as an illustrator and book designer. He has illustrated several Curious George books, as well as the BabyLit alphabet books and The Big Book of Superheroes for Gibbs Smith. Bob Cooper is a veteran editor whose twenty-year career has found him working on everything from comic books to art, architecture, and children's titles.